Turin is a major industrial city on the west bank of the Po river in Piedmont, northwest Italy. Over a 900,000 people live in it. 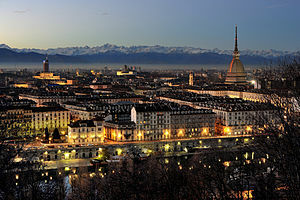 Turin is the fourth largest city in Italy, after Rome, Milan and Naples. Turin is the capital of Piedmont. Fiat's first car factory was in Turin. The city was the host of the 2006 Winter Olympics. In Turin there are two major rivers the Po and the Dora, and two minor rivers the Stura and the Sangone. Turin was the first capital of Italy in 1861. It had previously been the capital of the Kingdom of Sardinia and before that it was the capital of the Duchy of Savoy. Filippo Juvarra designed many churches and palaces in the city. This page was last changed on 4 October 2016, at 10:43.